Imagine you build a new house but, instead of having Bob Vila work on it, you have a bunch of congressmen do the plumbing. Your house has four toilets with standard three-inch outlet pipes. But your congressmen have the four drainpipes merge into a one-inch sewage pipe that goes to the street. You don't find out about the plumbing design until you invite the whole family over to a housewarming party. Grandma makes her special chili — but the ground beef was not fully cooked. All four of your bathrooms are in use, getting simultaneous flushes. Your congressionally designed plumbing system backlogs and now you need a professional cleaning service. I have frequently written about the Fundamental Paradox of Immigration Reform. That is, the problem with fixing immigration is that the fix has to be done by the same folks who broke it in the first place. The Immigration Act of 1990 was supposed to fix problems in the immigration system. Unfortunately, the bill's drafters possessed a level of incompetence that had not been seen before in immigration legislation. The 1990 Act created such monstrosities as the H-1B visa and the Diversity Lottery. The House report on the bill states, "The Committee believes that increased immigration levels should not lead to a dependence on foreign workers." Of course, the Immigration Act of 1990 solidified industry's dependence on foreign workers. The same report also states, "Employers seeking foreign workers have a special obligation to ensure that obtaining workers from abroad is a last resort." But the bill did not include such requirements so, for many employers, hiring abroad is the first resort. Let's look at one specific failure: green card backlogs. The Immigration Act of 1990 nearly tripled the number of employment-based green cards. The stated goal for this increase was that, "The increase in numbers will also reduce the use of temporary workers for permanent jobs and displacement of American workers." By giving employers more green cards, they would need fewer guest workers. That sounds logical on the surface, but prior to 1990 there were three H category visas. These visas were strictly non-immigrant. That meant that an alien had to maintain a residence in his home country and show that he was not going to remain in the United States. In turn, this means that it was extremely difficult to switch from an H visa to a green card. The Immigration Act of 1990 made H-1B and L visas have "dual intent", meaning that H-1B workers could freely apply for green cards. ("Dual intent" is an Orwellian concept that means the visa holder can intend to return home and intend to stay permanently at the same time.) This change had the entirely predictably result of undermining the goal of reducing guestworkers in favor of green cards. If H-1B workers can eventually get green cards, employers have an incentive not to hire foreign workers using green cards. Green cards become a publicly provided fringe benefit for employers to induce aliens to become guestworkers. An employer can string a worker along for years in guestworker status (bound to the employer) while dangling the prospect of a green card before the foreign worker. Another factor in green card backlogs is per-country quotas. Since 1965, the United State has had a policy of diversity in immigration. Aliens from no country are allowed more than 7 percent of the green cards each year. With 140,000 employment-based green cards, that means each country is limited to about 10,000. 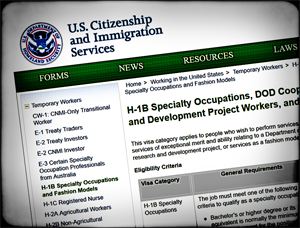 The drafters of the Immigration Act of 1990 allowed workers on H-1B visas to flow into the green card queue, but they did not impose matching per-country quotas on H-1B visas. Just like merging three-inch sewer pipes into a one-inch pipe, the dual intent combined with a lack of per-country quotas on H-1B visas created an entirely predictable result: green card backlogs. Because the H-1B program is nearly exclusively a path for importing labor from low wage countries, Indians received about three-quarters of the H-1B visas approved in FY 2016. The problem of telling 70,000 workers from India each year to apply for 10,000 green cards should have been apparent to all. The solution to this backlog problem is obvious (to all but members of Congress): Make H-1B and L visas truly non-immigrant, i.e., temporary. Force employers to choose up front whether they will hire a temporary guestworker or a permanent immigrant. That way, each foreign worker knows the day he arrives whether he is going to stay or go home. By 2000, the green card backlog for Indians had reached the six-year term of an H-1B visa. Again, demonstrating the Fundamental Paradox of Immigration Reform, Congress addressed this problem by allowing aliens to remain in H-1B status indefinitely while they had a pending green card petition. The entirely predictable result of this change: even bigger backlogs. Keep in mind that the green card backlog problem is limited. Currently it affects just three countries: China, India, and the Philippines. An employer can still hire a worker from any other country directly on a green card. In addition, the backlog does not affect those in the highest priority, so even an Indian Albert Einstein would not be affected. For ordinary workers from India, the backlog is approaching 10 years and growing. Currently before Congress we have a new demonstration of the Fundamental Paradox of Immigration Reform on this very issue: Rep. Kevin Yoder's (R-Kan.) "Fairness for High Skilled Immigrants Act of 2017" (H.R.392). This bill takes the radical step of eliminating per-country quotas on green cards. Indians get 75 percent of the H-1B visas. The green card backlogs would remain except that India's pain would be eased by inflicting it on other countries. In short, enacting this bill would create a trainwreck in the immigration system. But that has not stopped a majority of the members of the House from co-sponsoring this bill; another illustration of the Fundamental Paradox of Immigration Reform.